Edited by: James Essegbey, Dalina Kallulli, Adams Bodomo. With an introduction by: James Essegbey, Dalina Kallulli, Adams Bodomo. With contributions by: Hasiyatu Abubakari, Felix Ameka, Dorothee Beermann, Adams Bodomo, James Essegbey [show more…], Lars Hellan, Dalina Kallulli, Mary Esther Kropp Dakubu †. Edited by: Pius W. Akumbu, Esther P. Chie. With a foreword by: Michel Kenmogne. With an introduction by: Pius W. Akumbu. With contributions by: Pius W. Akumbu, Melvice Asohsi, Lilian Lem Atanga, Esther P. Chie, Pierpaolo Di Carlo [show more…], Jeff Good, Guillaume Guitang, Hugues Carlos Gueche Fotso, Larry Hyman, Roland Kießling, Lydie Christelle Talla Makoudjou, Solange Mekamgoum, Philip Mutaka, Patrick Mve, Magdaline Bakume Nkongho, Edmond Ossoko, Ousmanou, Patricia Schneider-Zioga, Keith Snyder, Emmanuel Tabah, Florence A. E. Tabe, Kilian Tameh, James N. Tasah, Eunice Tita, Nelson C. Tschonghongei, Emmanuel Ngué Um. Edited by: Gertrud Schneider-Blum, Birgit Hellwig, Gerrit J. Dimmendaal. With an introduction by: Gerrit J. Dimmendaal. With contributions by: Waleed Alshareef, Abeer Bashir, Roger M. Blench, Gerrit J. Dimmendaal, Birgit Hellwig [show more…], Ali Ibrahim, Angelika Jakobi, Ibrahim Kannu, Maha Abdu Aldawi Abdalla, Russell Norton, Ulrike Nüsslein, Lena Pointner, Nicolas Quint, Sharon Rose, Sawsan Abdel Aziz Mohammed Nashid, Thilo C. Schadeberg, Gertrud Schneider-Blum, Siddig Ali Karmal Koko, Heleen Smits, Darryl Turner, John Vanderelst, Nataliya Veit, Katherine Walker. Edited by: Samuel Gyasi Obeng, Christopher R. Green. With contributions by: Michael C. Dow, Francis O. Egbokhare, Christopher R. Green, Abbie E. Hantgan-Sonko, Philip J. Jaggar [show more…], Samson Lotven, Roxana Ma Newman, Samuel Gyasi Obeng, Seth A. Ofori, Nina Pawlak, Kofi K. Saah, Ronald P. Schaefer, H. Ekkehard Wolff. Edited by: Denis Creissels, Konstantin Pozdniakov. With a preface by: Denis Creissels, Konstantin Pozdniakov. With contributions by: Sokhna Bao Diop, Alain-Christian Bassène, Séckou Biaye, Denis Creissels, Anna Marie Diagne [show more…], El Hadji Dieye, Diagne Mbacké, Loïc-Michel Perrin, Konstantin Pozdniakov, Nicolas Quint, Stéphane Robert, Guillaume Segerer, Sylvie Voisin. Author: Joseph Koni Muluwa, Koen Bostoen. With a preface by: Yvonne Bastin. Author: Evelyn Fogwe Chibaka. With a preface by: Roland Kießling, Beban Sammy Chumbow. Author: Pius W. Akumbu, Evelyn Fogwe Chibaka. Author: Roland Kießling. In collaboration with: Bong Marcellus Wung. Author: Nicolas Quint. Translated by: Philip Baker. In collaboration with: Siddig Ali Karmal Kokko. Author: Pius N. Tamanji †. Author: Alain-Christian Bassène. 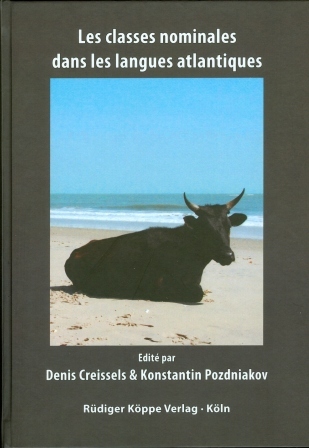 With a preface by: Denis Creissels. Author: Robert Botne. In collaboration with: Hannington Ochwada, Michael R. Marlo. Edited by: Firmin Ahoua, William R. Leben. With contributions by: Alain Albert Adékpaté, Rachel Adjoumani, Firmin Ahoua, Mouchi Blaise Ahua, Achimi Alabi [show more…], Bohoussou Amani, Florence M.L. Anguié, Edmond N. Apia, Dolores Djougba, Djaki Carlos Goprou, Guy Kaul, Kouadio Raymond Konan, Yao Emmanuel Kouamé, William R. Leben, François Mondo, Irma Ouattara, Jean-Yves Takouo, Krotum-Maï Traoré. Author: Zygmunt Frajzyngier, Muhammed M. Munkaila. Author: Wilhelm J.G. Möhlig, Lutz Marten, Jekura Uaurika Kavari. Edited by: Beban Sammy Chumbow, Ngessimo M. Mutaka. With contributions by: Akeriweh, Akinbiyi Akinlabi, Stephen C. Anderson, Edmond Biloa, Emmanuel Chia [show more…], Bruce Connell, Virginie Dangang, Jonas K. Diokdi, Juliette Clarisse Mabou Fodop, Richard Gravina, Jeanne Chantal Harerimana, Lucy Kenfac, Michel Kenmogne, Frida Kong, Béatrice Kouémou, Myles Leitch, Herman Misse, Ngessimo M. Mutaka, Clotaire Mvakang, Ndzengue Lucia Nassuna, Louise A. Ngamngne, Comfort Che Ngum, Antoine Owona, James S. Roberts, Bonaventure M. Sala, Keith Snyder, Maurice Tadadjeu, Pius N. Tamanji †, John R. Watters. Author: Kézié Koyenzi Lébikaza †. Edited by: Jean A. Blanchon, Denis Creissels. With contributions by: Jean A. Blanchon, Pierre Boungou, Denis Creissels, Gérard Philippson, Gisèle Teil-Dautrey [show more…], Lolke J. van der Veen.